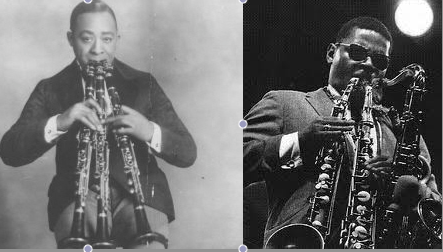 What do Fess Williams and Eric Dolphy have in common? For starters, both played for none other than Charles Mingus. Dolphy, prophet of the jazz avant-garde, deeply admired by Mingus and considered one of the most galvanizing forces to ever play with the bassist/composer, and Williams, an incredibly popular bandleader during the twenties, now mostly remembered for his gas pipe clarinet that even diehard collectors merely tolerate: both appeared at Mingus’ (in)famous Town Hall Concert of 1962. Dolphy performed most of the show, but Mingus brought Williams, a.k.a. his Uncle Stanley, onstage briefly to show off some circular breathing. Even more important than a boss or an uncle, Williams and Dolphy share an ear for the humorous and disturbing, a penchant for making their instruments squeak, honk and pop, throwing in plenty of gangly dissonances and other sounds that most musicians leave behind alongside soft reeds and method books. and it’s easy to hear that both reedmen simply love sound: the more jarring, the better. It’s fun to imagine Dolphy and Williams backstage at Town Hall, not saying a word but merely trading squawks and fractured themes. Both Williams and Dolphy also snub their noses at the clean lines and cultivated timbres no doubt enforced at the conservatories they trained in. That makes them both rebels, and jazz loves a good rebel! Yet given Williams’ period of activity and the large audiences he played to, his rejection of classical instruction seems more commercial, and therefore more suspect. Most jazz histories (when they mention Williams at all) relegate him to “novelty.” Williams was out to make a buck, Dolphy sought to change ears and minds. Dolphy is the artist, Williams was merely an entertainer. Yet even assuming that Williams was just goofing off to make a buck and that Dolphy was in fact the serious artist pushing boundaries, all the listener is left with is the sound. The sound is out there to be heard. Trying asking it about its motives, or whether it’s a novelty or work of art. While We’re At It, Rahsaan Roland Kirk (Right) Stole Wilbur Sweatman’s Act! Sound observations, Figg. Me and my gangly dissonances thank you! Thanks for reading to both of you! Glad you enjoyed the post. Beware, or maybe just avoid entirely…? Rahsaan Roland Kirk is not an act! All meant in good fun. Thanks for reading!